If you thought for a second that Nintendo wasn't going to bring Mario Kart to 3DS, than I guess today is your lucky day. For most of us however, the game's biggest surprise is the addition of flying and undersea racing. Nintendo has also added Mii support and the standard array of 3DS features; Spot Pass, Street Pass, and wireless multiplayer. 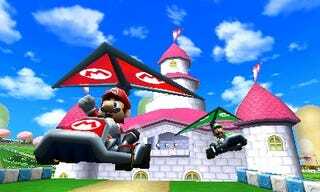 To get a better sense of what Mario Kart 3DS actually looks like, check out this trailer and the gallery below.